Tri-Village’s Austin Bruner (10) goes a big gain against Dixie on Friday night. Bruner helped lead the Patriots to a 27-19 win over the Greyhounds to remain undefeated this season. 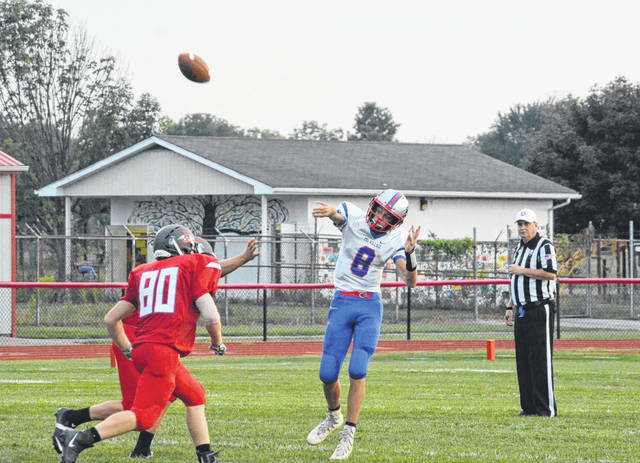 Tri-Village’s Layne Sarver (8) unleashes a pass down field against Dixie on Friday night. Sarver helped lead the Patriots to a 27-19 win over the Greyhounds to remain undefeated this season. 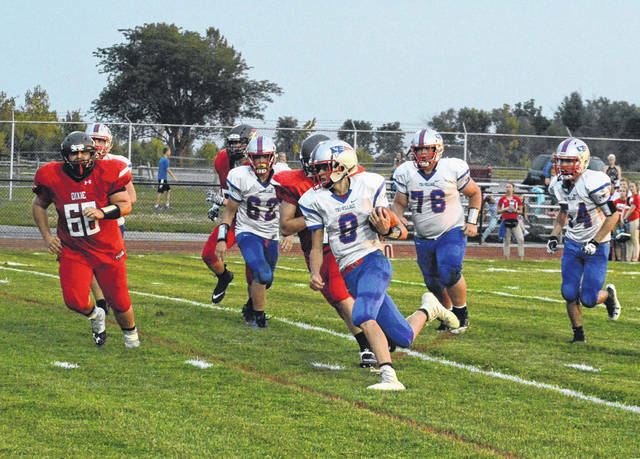 Tri-Village’s Layne Sarver (8) goes a big gain against Dixie on Friday night. Sarver helped lead the Patriots to a 27-19 win over the Greyhounds to remain undefeated this season. 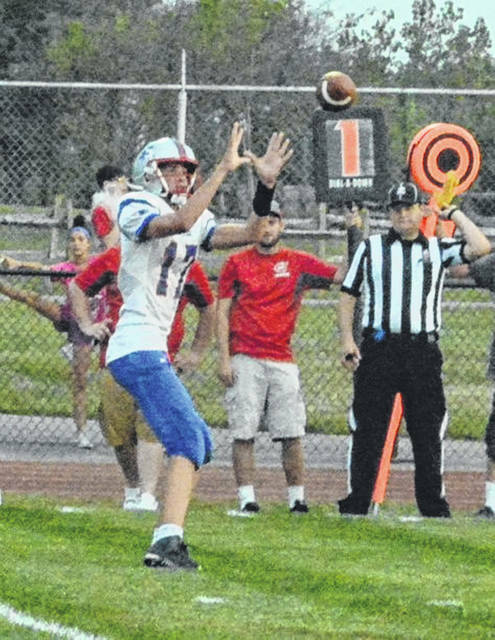 Tri-Village’s Zach Dowler (11) looks the ball into his hands for a reception against Dixie on Friday night. The Patriots defeated the Greyhounds 27-19 to remain undefeated this season. 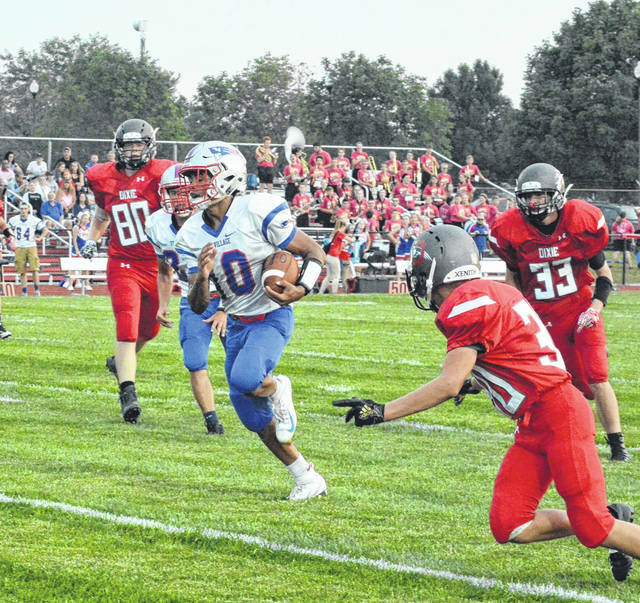 NEW LEBANON – In a CCC vs. SWBL contest, it was the Patriots who would make big plays at the right time to beat Dixie on their home field. It was an exciting contest for the fans – the end was in doubt until the last minute. And as if there wasn’t enough drama on the field, it would later turn out that there was some drama off the field as well. The Patriots managed to power through it all for a 27-19 win. Both teams have freshman quarterbacks and senior running backs. Both teams offensive lines are a similar mix of veterans and fresh faces. So there is a lot in common in the two teams. But Tri-Village was playing without one player who was out due to a suspension from the previous game and had some injuries – meaning that there wasn’t much of bench for the Patriots against a deeper Dixie team. Fatigue became a factor in the second half. A big factor for the Patriots was points off of turnovers. The defense had two interceptions and two fumble recoveries. Three of these were converted into scores. The last fumble recovery was not converted into points, but would stop Dixie’s last drive cold. The Patriots did give up one interception. Dixie jumped on the board with a strong opening drive that put the Patriots on their heels. But Tri-Village got on the board swiftly. A 40-yard return by Tylor Cheeseman helped set up the score. Austin Bruner finished the drive with a 2-yard TD run. Tri-Village would make the next two scores and seemed ready to break away with the game. Bruner turned around and made an interception at the close of the first quarter. Again, it was Bruner who scored on a 15-yard run to finish the ensuing drive. The next score was set up by a curious chain of events. Tri-Village was driving, but Dixie’s Zach Mitchell snagged an errant Layne Sarver pass. On its very first play Dixie had a bad pitch and Dylan Finkbine pounced on the bouncing ball to put the Patriots back in action on the Dixie 24-yard line. Sarver ran the ball in from the 8-yard line to finish Patriot scoring for the half. But a break down on special teams allowed Dixie to stay in the game. Dixie’s Hunter Leis took the kick off and ran the ball 71 yards to make the score 21-13 in favor of Tri-Village. In the second half, Tri-Village seemed spent. They are a lean team playing against a beefier and deeper Dixie team. Dixie was getting mileage on offense with power sweeps. Then once Tri-Village adjusted they switched to pounding in between the tackles. The Patriots couldn’t seem to stop their offense. Coach Burk sensed that the team was getting dispirited and beaten down – he ran to the stands and exhorted the crowd. Dixie scored but missed their two-point conversion try. It was now 21-19, Tri-Village with a slim lead . But feeding off of that energy, the Patriots seemed to play with renewed vigor. Drew Medaris intercepted a pass in the end zone giving the Patriots the ball on their own 20 with 4:28 left in the game. The Patriots used a wildcat formation and Bruner was able to give the Patriots a much needed first down. They were mainly looking to run out the clock at this point, but Bruner had one more touchdown in him. He plunged into the line, broke a tackle, found daylight and ran 68 yards to the end zone. At this point, the game was called on account of lightening in the area for the night and resumed on Saturday. This may have helped the Patriots as it allowed them to rest and recover. However, overnight the Patriots defensive coordinators mother passed away. So now the team had to play without one of their coaches. With 2:39 on the clock and the ball game on the line, a renewed Patriots team took the field. They kicked a pooch kick that was stopped at the Dixie 38. Dixie went back to what worked well for them the previous night. Student body left, student body right. They weren’t getting huge chunks of yardage, but they were getting 5-6 yards a pop and moving the chains. They advanced into Tri-Village territory where they took their last time out with 1:33 left. A big play was needed and Mason Sullenbarger delivered. The ball squirted free into a mix of Dixie and Patriot players and he emerged from the pile of players ball in hand. The Patriots were able to run out the clock and exit with their second win the season. Their first order of business after shaking hands – giving a huge victory shout out to their missing coach via cell phone. Next week Tri-Village (2-0) opens CCC play against Bethel (2-0) at home. https://www.dailyadvocate.com/wp-content/uploads/sites/34/2018/09/web1_Austin-Bruner-2.jpgTri-Village’s Austin Bruner (10) goes a big gain against Dixie on Friday night. Bruner helped lead the Patriots to a 27-19 win over the Greyhounds to remain undefeated this season. https://www.dailyadvocate.com/wp-content/uploads/sites/34/2018/09/web1_Layne-Sarver-1.jpgTri-Village’s Layne Sarver (8) unleashes a pass down field against Dixie on Friday night. Sarver helped lead the Patriots to a 27-19 win over the Greyhounds to remain undefeated this season. https://www.dailyadvocate.com/wp-content/uploads/sites/34/2018/09/web1_Layne-Sarver-2.jpgTri-Village’s Layne Sarver (8) goes a big gain against Dixie on Friday night. Sarver helped lead the Patriots to a 27-19 win over the Greyhounds to remain undefeated this season. https://www.dailyadvocate.com/wp-content/uploads/sites/34/2018/09/web1_Zach-Dowler-1.jpgTri-Village’s Zach Dowler (11) looks the ball into his hands for a reception against Dixie on Friday night. The Patriots defeated the Greyhounds 27-19 to remain undefeated this season. This entry was tagged Austin Bruner, CCC, Dixie Greyhounds, Robert Burk, SWBL, Tri-Village Patriots, Tylor Cheeseman. Bookmark the permalink.